La Bella Vernice Ghostbusters Review and Giveaway! I am so happy to bring you a review of Ghostbusters from La Bella Vernice. If you are not a fan of La Bella Vernice on facebook you are truly missing out on some of the finest quality nail lacquer I have ever tried. 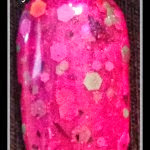 Most polish you get e few specks of glitter here and there; not La Bella Vernice. I applied 2 coats of Ghostbusters and had amazing covering and shine! Ghostbusters is composed of bright blue glitter sprinkles and large clear and mint green flakes of glitter in a clear polish! This shade is perfect for the spooky Halloween Fashionista! 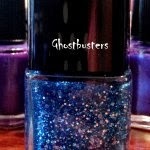 Ghostbusters is so affordably priced starting at $4.50 for a mini 5 ml. bottle and $9.00 for the standard 15 ml bottle of polish. To purchase any of La Bella Vernice's Awesome shades go to La Bella Vernice Shop! 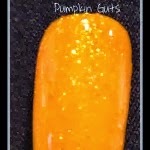 Check out her other amazing Halloween inspired shades below Pumpkin Guts (my personal favorite) and Bewitched (also very bewitching)! Now for the great part La Bella Vernice has given you guys a chance to win a full size 15ml bottle of Ghostbuster's just enter below! And if you get a chance go to La Bella Vernice's Page on facebook and thank her for this awesome giveaway!